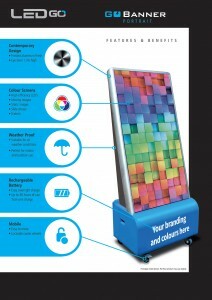 Call us today about our LED Go-Banner, it’s the ultimate street signage tool !! Customers need to know who you are, where you are and what you do, and there’s no better way than with bright, eye catching Digital and Outdoor LED Message Signs. Milestone signs use colorful, bright and attention grabbing animation to attract potential customers. Our signs are easy to program and even easier to use. They have the added benefit of being able to be changed quickly so their messages keep up with current offerings and trends. Display listings, visual walk arounds, rentals, upcoming properties, successes. Really catch the attention of passing traffic, target your audience, advertise opening hours, promotions, or just draw attention to yourself. The list is endless….